I woke up to the sound of rain this morning!! I know, I know, you East, South, Northwest, etc. Coasters say whoopidy doo, right? Well, here in So. Cal, we haven't had ANY rain since the beginning of December! AND, since it is Saturday and I don't have to worry about RAINY DAY SCHEDULE, I love it!! We filled out the story map together, because this is the first time I introduced them to this type of Story Map. You can get your own copy of this here! The igloo I found on Jan Brett's website and I shrunk it down to half the size. 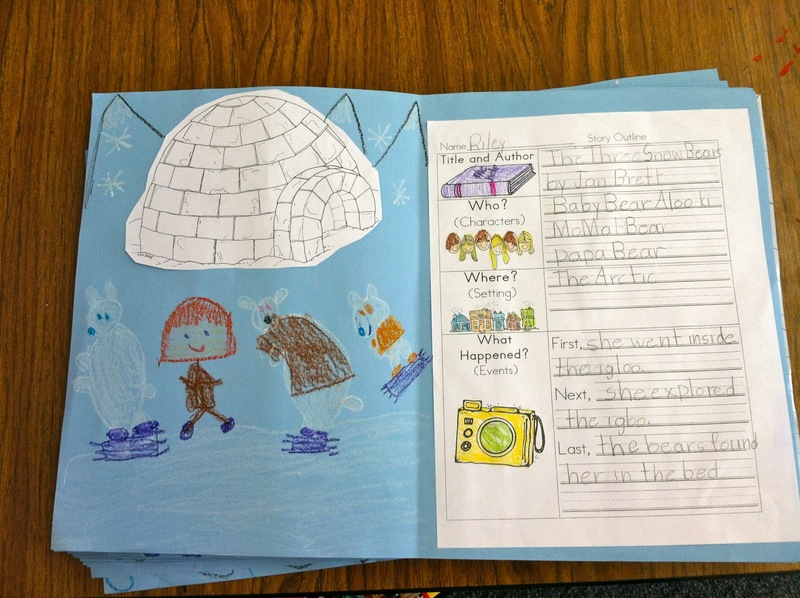 Click here for the igloo. We wrote the poem that I posted about here. It is actually a song, so I taught it to them first, and then we wrote it. You can also grab the writing paper from that post and save it for next year! 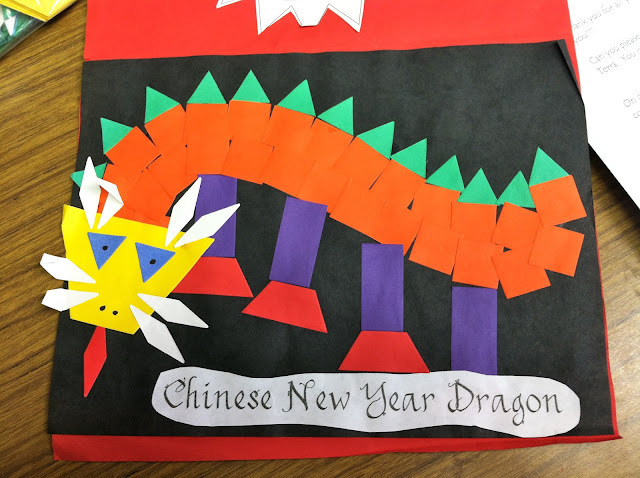 Looking ahead to next week, we will be making these fun little Chinese New Year Dragons made totally from die cut shapes. These are oldies but goodies! I created these in 2001, so maybe you could call them "vintage??" HA!! 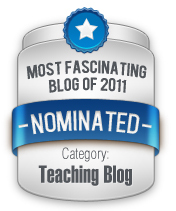 We also found out that our little blog was nominated as a "Most Fascinating Teaching Blog" in 2011!! WOW! What an honor! We feel so blessed to be a part of such a wonderful community of dedicated ladies and gentlemen who are passionate about children!! YAY for Teaching! Can I get a whoot whoot?? can you share the Chinese New Year poem? 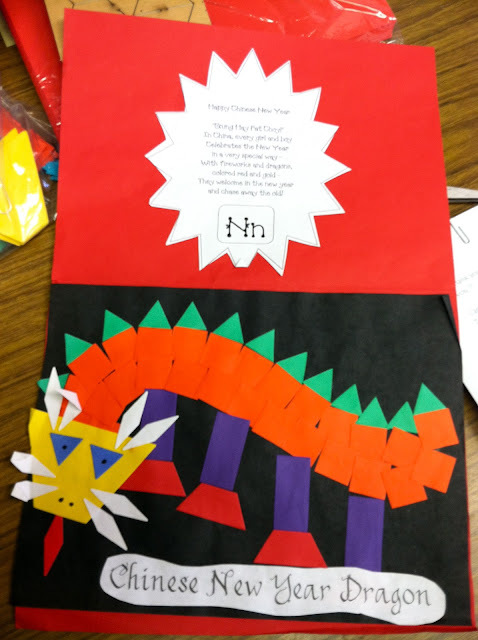 I will try the dragon with my kinders. We have two families sharing about Chinese New Year on Monday. I LOVE the pattern block dragons! I have been teaching for over 20 years, so I laughed when you called your project "vintage!" 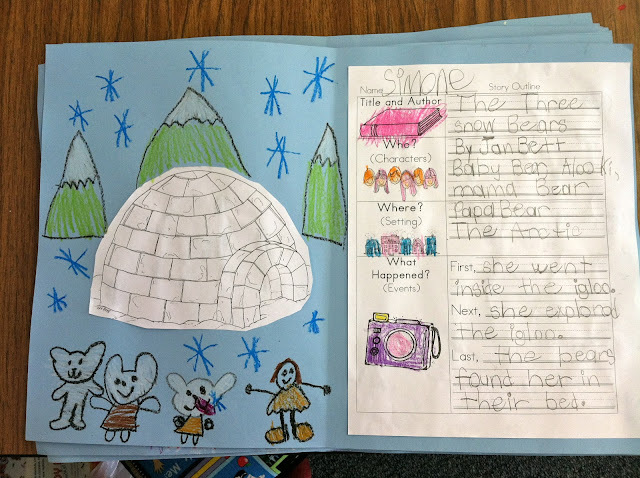 The story map writing was also very good and I like the igloo art. Creative! I also would love the poem, but I also wanted to ask if you have the dragon pattern or info available? LOVE it!! Adorable ideas. Thank you for the freebies. Those dragons are awesome. I don't have the die-cut but maybe pattern block shapes. Love all of those projects!!!! I LOVE those chinese dragons!!!! Too cool!!!!! I love the Chinese dragons!!!!!!!! SO CUTE!!!!! oh my! I would LOVE to have some rain...we haven't had any here in east central fl either in FOREVER!!! and I. Am. In. LOVE. with those dragons!! It is like you guys can read my mind! I needed ideas for Three Snow Bears AND Chinese New Year dragon stuff! The dragons will go perfectly with our geometry unit we are working on in math. Thank you!!! I love, love, LOVE your projects! Everything turned out so well. Why can't you be on my team? I looooove it all!!! Especially the student Three Bears project!!!! Can't wait to use the story map, I love the simple layout! I love your story elements!! I'm going to use those this week in my reading groups! Thanks so much. Adorable! Wondering if you have a copy of the poem, as I could not make out all the words in your picture? Many thanks! Can I have a copy of your poem and dragon pattern?